With so many alternative crypto currencies nowadays it is hard to keep track of all of them, so services such as PoolWarz appeared that offer to provide you with a single mining pool where you can mine the right alternative currency at the right moment. This happens by tracking the exchange rates and difficulties of many alternative crypto currencies and calculating the most profitable at the specific time, so that the workers in the pool can be switched to mine that exact cryptocoin. You might be already multiple crypto currency mining pool like the Multipool (only a mining multi pool) or CoinEX (multi pool and exchange in one), but there is a new interesting player called PoolWarz that is supposed to offer a more streamlined and user friendly interface. This service is still in beta and there is a long queue already by people that are waiting in line to get their chance to register and try it out. 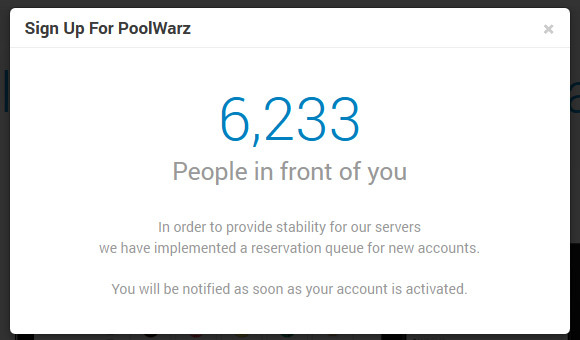 We just tried it out and got a message saying 6233 people are waiting in front of us to try out the service, so you can save some time and not bother with PoolWarz for now and instead go to some of the other services we’ve mentioned already that allow you to register and start using them immediately! Update: Now, about a month later we’ve checked the situation and the website reports that there are currently 1233 people ahead of us, so as we’ve said – do not bother with that service for now at all. There are many other alternatives that will not tell you to wait for them for months just to try them. Update 2: Five weeks later since our signup and we have finally received a login for the Poolwarz service, so we are going to be able to try it out finally.